Her real name was Helen Beatrix Potter. Notice that she has the same last name as Harry. And like J. K. Rowling, Potter, the author of the bunny tales became wealthy from her writing. Hmmmm. Similarities end there. As a child in the late 1800s, Beatrix Potter spent many holidays in England’s glorious Lake District. 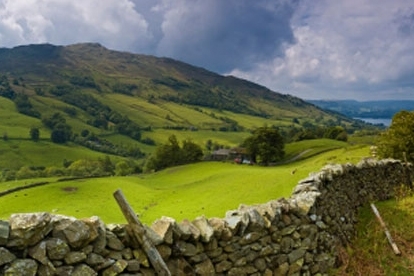 Only three-and-a-half hours from London by train, it is a land of stone houses, hedgerows, rolling hills, and sheep. Lots and lots of sheep. The area holds 16 lakes, England’s five highest mountains, and thousands of miles of walking trails, and it is home to the country’s deepest lake, Wastwater; steepest road, Hardknott Pass; and tallest mountain, Scafell Pike. It is a wonderful place to visit with your grandchildren. The best months to visit are May and June, when lambs and wildflowers abound. But it is also heavenly in summer, when people crush in, and in September and October, when the leaves change and it becomes quieter. Many attractions close for the cold winter. Most tourists from other countries come from Japan; it could be related to the fact that Potter’s books are used to teach English in Japanese schools. Potter’s “little books” finally started selling, and she started buying land. When she died in 1943, she bequeathed her properties to the National Trust, now the area’s largest land owner. Of the 91 farms it owns, 14 once belonged to Potter. The picturesque towns and landscape of the Lake District are bound to inspire your grandchild’s imagination, as they did Potter’s. You’ll be introduced to her beloved Herdwick sheep, walk well-marked paths, and eat in family-friendly pubs. Potter studied mycology (fungi, including mushrooms) at Kew Gardens and painted true-to-life specimens, but she ran into the glass ceiling of her day in this male-dominated field. In addition to seeing some of her early drawings, you’ll view a large collection of her more than 500 fungi watercolors and drawings. The False Death Caps and Scarlet Elf Caps are particularly lovely. In an activities corner, children try their hand at drawing mushrooms and at making printing stamps. Potter was first an artist; second, she was a writer. This becomes apparent as you study her original sketches and watercolor-illustrations, displayed here in the 17th-century building that once held her husband’s legal offices. Children have no trouble entering the low door openings of this old cottage, but adults are advised to mind their head. A free activity-sheet keeps kids busy looking for items in the gallery. Potter wrote most of her books in this tiny, creaky-floored 17th-century cottage. She purchased the property with royalties earned from her first book, The Tale of Peter Rabbit, based on her pet bunny, Peter Piper. The furnishings, library, and gardens are maintained exactly as she left them. Like Rebecca and Lauren, you and your grandchild will be delighted to see the house illustrated in The Tale of Samuel Whiskers, and the cottage garden of The Tale of Jemima Puddle-Duck, and The Tale of Tom Kitten. The easy graded, paved path around this lovely forested lake — its name means “the tear lake in the hills” — is a popular walk and takes only about an hour. Kids laugh and dogs bark while romping happily. Potter bequeathed this land to the National Trust. Aimed directly at children, this indoor attraction begins with a charming animated film depicting Potter’s characters. You then walk past three-dimensional scenes from all 23 of her tales. They include Peter Rabbit’s garden and Mr. McGregor’s greenhouse, and each is portrayed with life-size creatures. A shop is stuffed with related goods, and the Tailor of Gloucester tearoom offers refreshment. This is the perfect destination on a rainy, Lake District day. Potter purchased Yew Tree Farm in 1930 to save it from developers. It is located just a short walk down a scenic lane from Tarn Hows. You can dine here now amidst her original furnishings, paintings, and collectibles. Lunch and tea are also served at picnic tables in the front yard, within the property’s rustic drywall fences. Try a ploughman’s sandwich, a country pie, or a Rum Nicky sticky tart made with rum, ginger, and dates. Don’t miss the scrumptious scones served with clotted cream and delectable wild Damson plum jam. Herdwick sheep and black-and-white Belted Galloway cows (also called “Oreo cows”) graze on the property, which was a key location in the recent Miss Potter film. Imagine the thrill of staying in one of Beatrix Potter’s original farmsteads! Six are listed by the National Trust. Or stay in a bargain-priced camping barn. These old stone farm buildings are also referred to as “stone tents” and are great for groups. Potter’s family once rented this property as a holiday vacation home. She fell in love with it and later bought it as a home for her mother. Potter wrote Timmy Tiptoes and Pigling Bland while staying here. It has two family rooms and an indoor pool, and children younger than 17 stay free in their parents’ room, breakfast included.